TBreq provides the features to assist with quality and certification standards for multi-level and bi-directional requirements traceability and impact analysis. TBreq is the easiest way to link requirements, design, development, testing and verification workflow with your Requirements Management tools and your design and development tool chain. 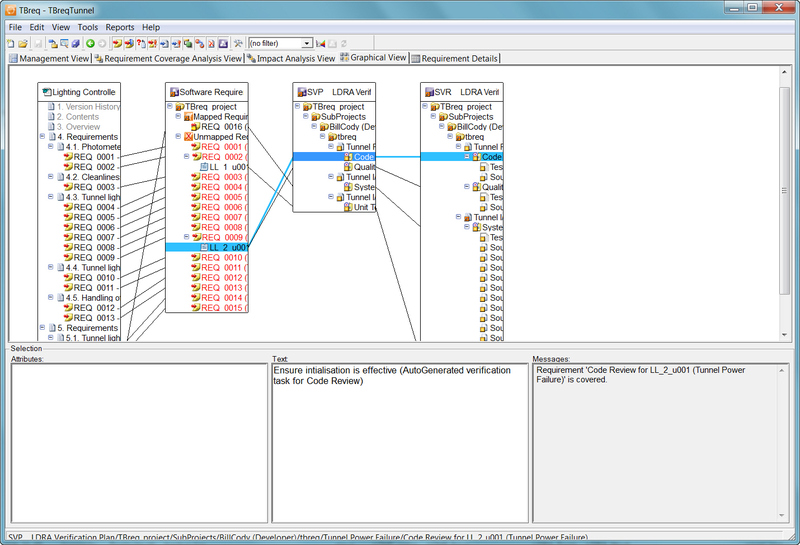 TBreq, through its integration with the LDRA tool suite which includes LDRA Testbed® and TBrun® (unit testing component), is a unique solution that can help your team overcome the challenges of allocating requirements to team members, mapping requirements to design and source code, linking test cases to requirements and the generation of verification reports. 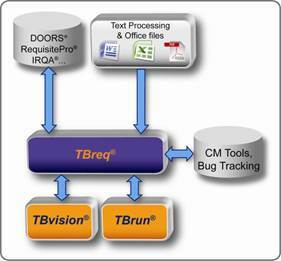 TBreq interfaces directly with your management tool (IBM® Rational® DOORS®, IBM® Rational® RequisitePro®, Microsoft® Word or Microsoft® Excel) to ensure traceability across your software lifecycle and the completeness of your requirements coverage. 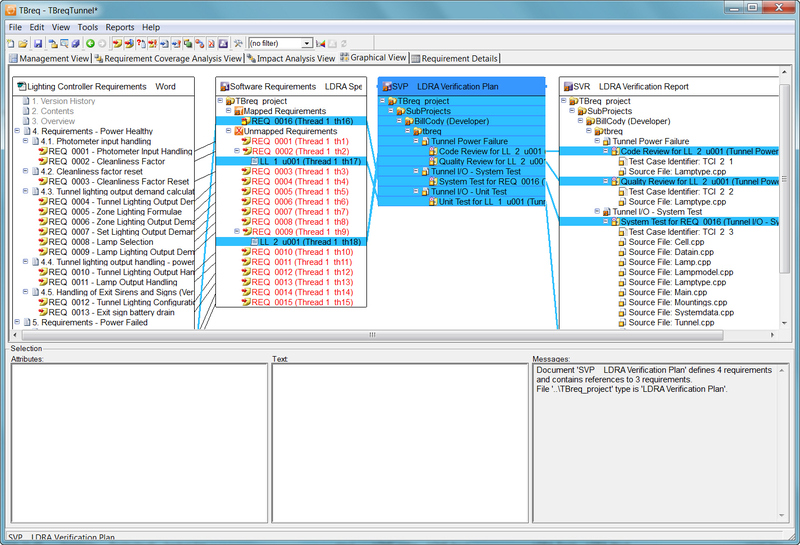 Within the LDRA tool suite, TBreq creates test specifications and executable test cases directly from requirements. Test results are automatically returned to the Requirements Management tool to provide "round-trip requirements traceability verification." A key feature of TBreq is its ability to capture requirements (high-level, derived and low-level) from any management tool and source; while providing an intuitive interface for traceability, test case generation and requirements verification. All of these features combine to make TBreq the most effective solution for Requirements Management on the market today. Qualification represents the agreement from Certification Authorities to reduce or replace manual activities with tool results and verifications. TBreq complies with the most demanding quality standards: CMMI, DO-178B/C for Avionics, EN-50128 for Railway transportation and IEC 61508 for Industrial automation to name a few. The tool is compliant with the AIRBUS process for A380 & A340 projects, Boeing 787, F-35 Lightning II, NASA CEV and other major projects. TBreq is qualifiable according to all of these standards, and LDRA can assist in this qualification process. LDRA also offers a Tool Qualification Pack to assist in the certification process. All of these features combine to make TBreq the most effective solution for collaborative requirements-based development and verification on the market today. Requirements are an essential building block of any project and hence managing change to requirements is a critical aspect of project management as a whole. TBreq provides an easy to use and highly configurable interface to your requirements management tool. 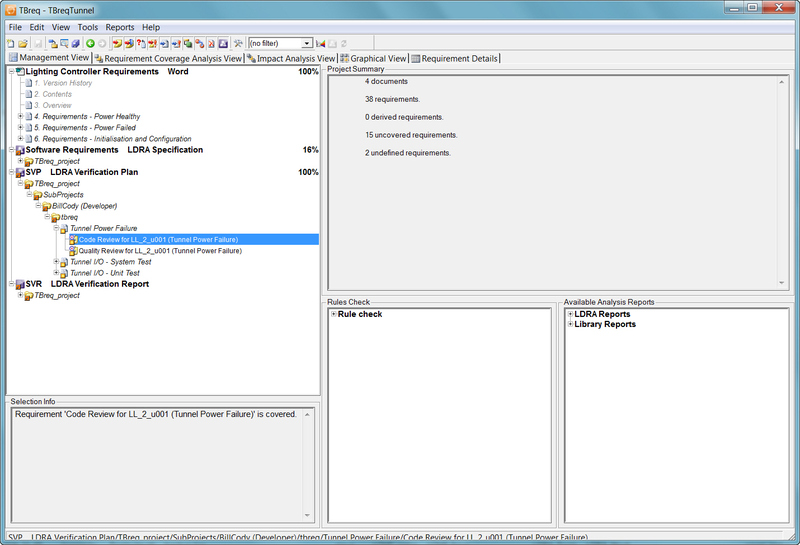 Allocated requirements and verification artefacts are made visible across a network of user workspaces. All informal changes and test results are recorded, so that all team members can identify which data might be "suspect." TBreq is unique in providing end-to-end, graphical traceability reports in a single view. Analysts and project managers can see a complete picture of traceability from software requirements to design, code, test specifications and test results. All reports are exportable to Word documents and may be easily customised to meet project needs.